During the three-day sale, Amazon will offer discounts on many smartphones including the OnePlus 6T, Realme U1, iPhone X, Honor View 20 and more. The sale will also provide exchange offers on Samsung Galaxy S9, LG V40, Vivo Nex, OPPO R17 Pro and more. The device will have a pop-up front-facing camera and it does not feature a notch on top of the display which is similar to what we’ve seen on the Vivo V15 Pro and Oppo F11 Pro. The new render also shows that the OnePlus 7 will feature a triple rear camera setup in the upper half of the back panel. The listing says that the smartphone is powered by the latest Qualcomm Snapdragon 855 processor along with Adreno 640 GPU. The phone is equipped with an 8GB of RAM and 256GB of internal storage. How did pop-up cameras on smartphones come into being? Smartphones from this age are entirely non-mechanical as manufacturers look to integrate whatever they can into a thin slab of innovation. As the demand for larger screens on phones increased, we've looked at a lot of designs that bring out the most screen space on a phone and one such idea is a pop-up camera. The Oppo F11 Pro features a 6.5-inch Full HD+ display with a screen resolution of 2340 x 1080 pixels. The phone is equipped with a 90 per cent screen-to-body ratio along with Corning Gorilla Glass protection. The smartphone is equipped with a gradient finish and boast some interesting hardware proposition. However, is it enough to woo the Indian consumers? 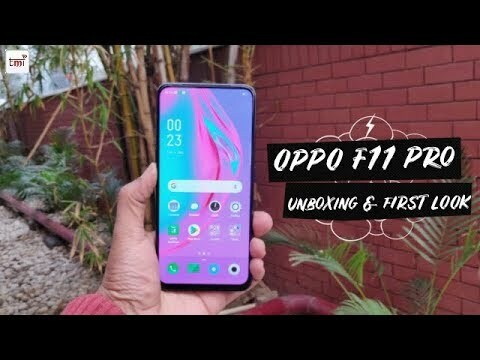 Oppo has announced the launch of new Oppo F11 Pro smartphone in India. The smartphone features a 6.5-inch Full HD+ display with a screen resolution of 2340 x 1080 pixels. The smartphone is powered by a MediaTek Helio P70 chipset along with 6GB of RAM and 64GB of internal storage. Oppo F11 Pro features a dual-camera setup with a combination of 48-megapixel primary lens along with 5-megapixel secondary shooter. For the front, there is a pop-up selfie camera that comes with a 16-megapixel selfie shooter.